Whether grown as single specimens or tucked in a group against a hillside, birch trees (Betula spp.) are characterized by their distinctive markings and slanting growth habit. Besides their appearance, they provide useful raw materials that are not limited simply to their bark. Acclimated to cold, harsh northern winters, birch trees share the woods with other deciduous trees as well as evergreens in many parts of North America. The trunks of birch trees with gold foliage in the fall. Painters and poets have memorialized the sight of the day's first sunlight striking the pure-white bark of the paper birch (Betula papyrifera), which is hardy in USDA zones 2 through 7. Classified as deciduous trees, which shed their leaves in fall, birches stand in stark contrast to their surroundings, whether against a bright-green lawn or interspersed among trees with less distinctive markings. 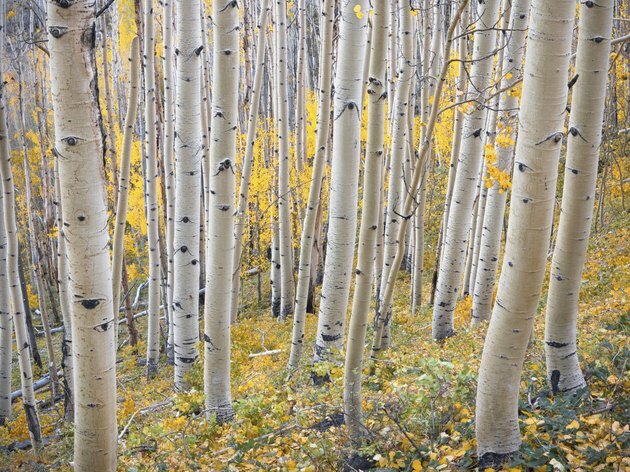 The bark of young paper birches is usually golden brown, but the bark turns white with age. The leaves of paper birch, also called white birch, silver birch and canoe birch, emerge greenish-yellow in spring, are bright green during summer and turn yellow in fall. The bark of the paper birch was widely used by American Indians to build canoes and wigwams. They also used it to produce baskets, arrow quivers and decorative items. The paper birch gets its name from another common use of its bark: as a medium on which to write. Considered a moderately dense wood by the U.S. Forest Service, paper birch wood is now used as fuel, a building material and chipped for pulp and paper manufacturing. Though less sweet than the sap of sugar maple (Acer saccharum), hardy in USDA zones 3 through 8, paper birch sap is used to make wine, beer and table syrup. Considered a short-lived tree, the paper birch provides valuable forage for many birds and mammals. Moose consume large quantities of birch leaves by browsing from the trees while deer eat large numbers of leaves that drop in fall. Porcupines feed on the inner bark while voles consume paper birch seeds, as do several bird species. Chickadees and nuthatches nest in the trunk cavities created by woodpeckers, and hummingbirds and red squirrels feed in holes created by sapsucker woodpeckers. 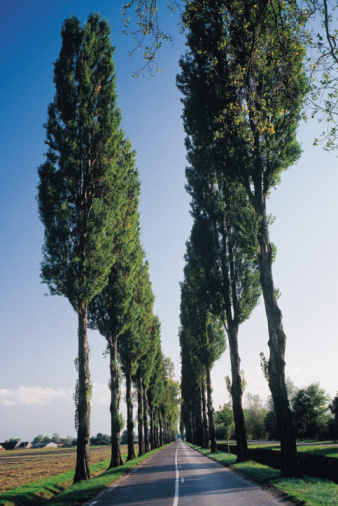 Thick stands of young trees provide shelter for wildlife, a feature that diminishes as the trees age and grow taller. The bark of the gray birch (Betula populifolia Marsh.) is white but does not pull away from the trunk like the bark of paper birch. Also a short-lived tree, the gray birch is hardy in USDA zones 3 through 8, where it often colonizes burned-out areas and other disturbed sites. The river birch (Betula nigra), hardy in USDA zones 4 through 9, is characterized by salmon-pink bark that curls and peels. The sweet birch (Betula lenta), hardy in USDA zones 4 through 7, has shiny, reddish-brown outer bark; its inner bark has an intense wintergreen scent, and furniture made from the wood darkens to a shade of mahogany.